A new collaborative project looking at developing an improved way of imaging the spinal cord. ImagiNg SPInal cord injury and assessing its pREDictive value. A quantifiable multi-centre spinal cord neuro-imaging project: INSPIRED. Magnetic Resonance Imaging (MRI) has revolutionised diagnosis in many fields of medicine but has proved difficult to use in spinal cord injury. The INSPIRED study aims to develop an improved way of imaging the spinal cord and brain via MRI scan. 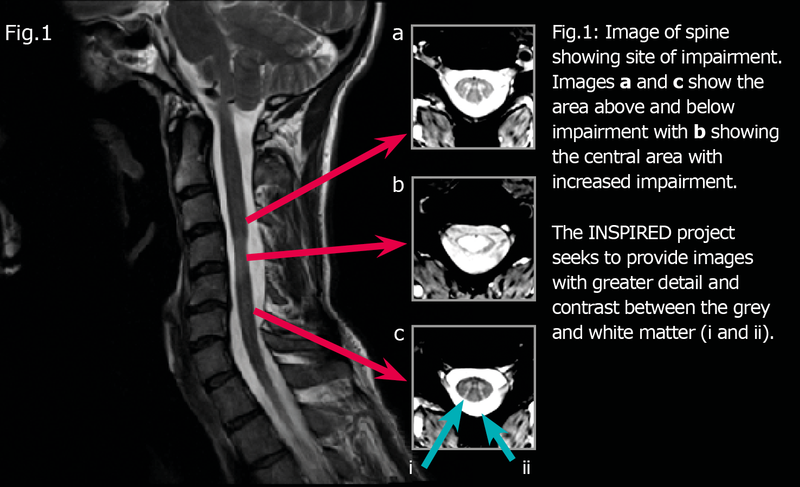 This improved imagery will capture information that will enhance diagnosis, prognosis, and potentially aid in decision making for treatment and rehabilitation for people with a spinal cord injury. The clinical part of the study will take place in two international locations, Zurich and Toronto, with MRI experts from other countries being involved in the analysis. The research will use scanners from three different manufacturers and will be the first of its kind to systematically assess and seek to overcome scanner variability. The studies will focus on patients with trauma at C2/3, the area at the back of the head and the neck. The majority of research patients will have cervical spondylotic myelopathy (CSM). However, a significant number of patients with a spinal cord injury will be included where there is minimal or no surgical instrumentation in place at C2/3. CSM and spinal cord injury share several aspects of myelopathy with a combination of alpha-motoneuron damage (lesion of central grey matter) as well as demyelination and axonal damage of long projecting spinal nerve fibre tracts (white matter damage) (Tetreault et al. 2013). Ensuring that the MRI scanning process developed is comfortable for the patient and can be done in different locations, with different scanners, to standards that allow direct comparison of imaging information from patient to patient, site to site, scanner to scanner. This exciting work could pave the way to develop objective imaging biomarkers enabling research in regeneration and repair strategies for spinal cord injury.Professor Michael Fehlings, Toronto Western Hospital, University of Toronto, Head of Spinal Program. Professor Michael Fehlings, Toronto Western Hospital, University of Toronto, Head of Spinal Program. Help us ensure that funding for our critical research continues by making a regular donation.